One of the first changes they made was to their summer grazing routine. Instead of 3 to 4 groups, they put all the cattle into one herd. 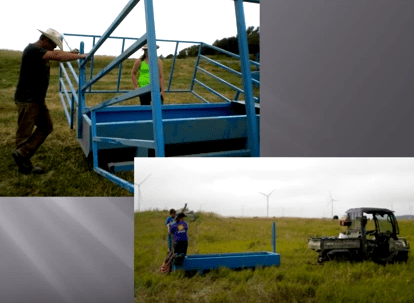 Their goal was to be able to use their land base more effectively, and to do this they knew they’d need more infrastructure so they could better manage their grasses. But the time and money in fencing and water developments that could make this possible was a big investment. In fact, Cody says that without the assistance they received, it would have taken them a lifetime to get it done. So where did they get the help? EQIP stands for “Environmental Quality Incentives Program.” Run by the Natural Resources Conservation Service (NRCS) it provides financial assistance to farmers and ranchers for practices that improve soil, water, plant, animal, air and related natural resources. You can read more about the program here. As with any government program, there’s some paperwork involved, but your local NRCS office has people to help. Check with them to see how it might work for you. In the Sands’ case, they were able to qualify for assistance under a part of the program focused on the Conservation Reserve Program (CRP). 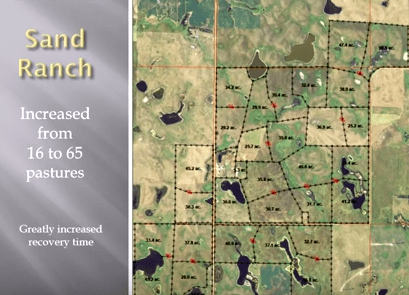 CRP lands are areas that a farmer agrees not to raise crops on for a certain period of time as a way of reducing erosion, and improving soil health and water quality. The Sands had grasslands that were coming out of this program, and NRCS wanted to encourage farmers to maintain them as grasslands. 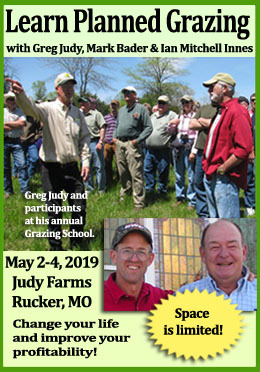 So with the support of funding from this program, they were able to get the fencing and support to turn their 16 large pastures into 65 pastures averaging a little under 40 acres each with fresh water in all pastures. They were also able to add fencing and water to what Cody and Deanna call “The Other Place” (OP). Here’s a map of the Sand Ranch home place. Every red dot is a watering point for cattle. 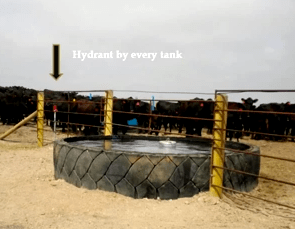 Sand Ranch cattle drink from 12 foot tire tanks that hold 15oo gallons of water. There is a curb stop at each tank so they can be turned on and off individually. They were worried about the possibility that, with so many cows drinking at once, the water level would drop and their calves wouldn’t be able to drink. So the Sands put a hydrant at every tank. Then they designed a portable calf watering system. It hooks up to the hydrant with a garden hose, holds about 450 gallons water, and has creep sides so that only the calves can get to the water. This creep waterer moves every time the cows move. The plant on the right is called “lead plant.” It is a very palatable plant, and so isn’t found on overgrazed pastures. It compliments little and big blue stem, and doesn’t compete with them for water because it is deep rooted. They’ve seen a lot of benefits from this kind of grazing. 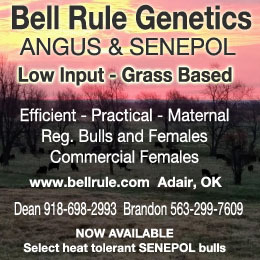 Cattle graze the pastures more evenly and they eat the less desirable plants along with the more desirable. It has also helped them deal with invasive species, in their case Kentucky Bluegrass. In just a few short years they’ve seen an absolute explosion of diversity on the ranch. When more cows graze in a smaller space for just a short time, they knock some grass down creating a littler mat. This improves soil health and reduces runoff, soil temperatures and evaporation. (You can read more about that here, as part of daughter Dessa’s science fair project.) High stock density grazing has also helped with fly control. They can move their herd far enough from the pastures they were just in that when fly larvae deposited in their manure hatch, they have no host. The dweller and tunnel dung beetles that have started to appear since the Sands quit using pour-on also help with fly control. They’ve also been able to increase the number of grazing days on their operation. A good example of this is the pasture they leased for 10 years and recently purchased. The landlord allowed them to graze 180 pairs for 5 months, giving them about 20 grazing days/acre. Now, with internal fencing and water points added, they’re up to 63 grazing days per acre, more than doubling the grazing days in just 2 years. But the biggest benefit, as so many others have found, is rest and recovery time. 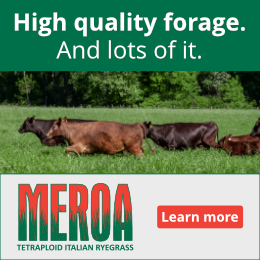 Cattle are in a lot of the pastures for only a few days a year, so when they return the forage is fully recovered. Even those that they felt they’d “overgrazed” recovered with adequate rest. That means that they have healthy soils and healthy forages and they’ve been able to expand their grazing season to reduce costs. The Sands didn’t re-enroll 400 acres of CRP and have been grazing it for the last three years. 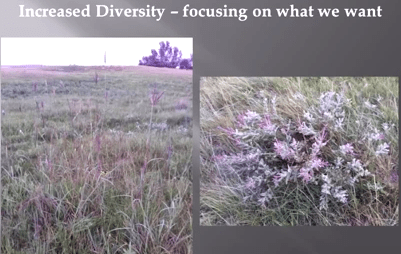 There are some challenges with grazing CRP because the land and forage is not as healthy as regularly used pastures. Cody notes that there is always a learning curve when you start something new. He says that looking back, he may have been too focused on the land and not enough on cows and first year, so the cows paid a price nutritionally. He says he probably should have moved them sooner or supplemented them. You can use his experience to adjust your grazing, but don’t let it stop you from trying. As Cody says, “We got through.” In just two short years they are seeing the land come back to life, and the plant spacings are becoming more dense. Dessa Sand’s science fair project looked at how grazing management affected water infiltration and runoff. 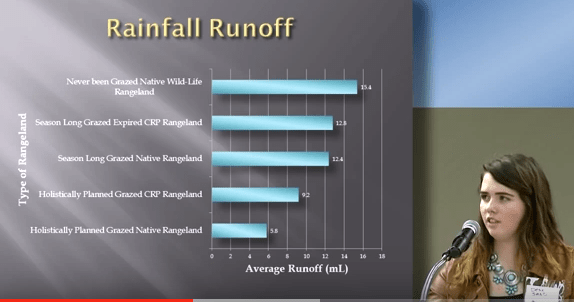 In this graph, the most run off occurs on never-grazed native rangeland, followed by season-long grazed expired CRP, season-long and grazed native rangeland. You can see how things have improved on holistically planned grazed CRP rangeland, and native rangeland which are the bottom two bars on the graph. In upcoming articles we’ll cover how the Sands’ herd is changing as they match the cows to their new operation. We’ll also look at the financial aspects of the changes in management and how that has changed their lives for the better. In the meantime, if you’ve got some “what ifs” or “Yeah but’s” in your head, do share them in the comments below. Maybe we can find some answers for you. And if you’d like to contact the Sands they can provide assistance through the North Dakota Grazing Lands Coalition Mentoring Network. Here’s the link on the network and how it works. Just scroll down to find Cody and Deanna Sand at the bottom of the page. Click here to read all the articles in the series.